Ever since Blythe was a toddler, he wanted to be an astronaut. At night he'd go outside with his telescope and gaze at the stars. He knew all of the constellations. His favorite was Orion. "One day I'm going to go in a spaceship and fly among the stars." 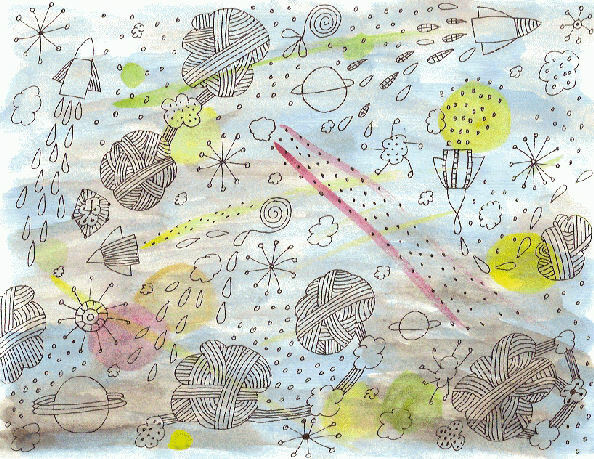 Blythe dreamed about comets, nebulas, black holes and galaxies far away. Blythe's father worked space ships. Sometimes he took Blythe to work with him and let him go inside. One day while Blythe was with his father, he climbed inside one of the space ships. His father smiled and said, "I've got a great idea, Blythe. I know you want to go for a ride in a space ship. Strap yourself in and we'll see what we can do." The boy could hardly believe it. "We're going into outer space?" His father snickered. "Of course. Sit back and close your eyes and don't open them until I tell you to." He went outside and spoke with some of the other men. they brought the space ship over to a building and then he climbed inside with his son. "You can open your eyes now." "Don't we need spaceship suits?" Blythe wanted to be able to breathe in space. "Not for this trip. This is a special space ship. We can go just like we are. Are you ready?" "I sure am, Dad." Blythe locked his seat belt and grabbed onto the arm rest. The spaceship began to shake back and forth. Outside the windows everything looked black. Blythe got a little nervous. The engines roared and the spaceship took off. Blythe felt his face and body push back into the seat. "I feel funny, Dad." "It's gravity. We'll be all right once we're up. Be patient." Dad chuckled to himself. Higher and higher they went. Blythe wasn't comfortable at all. His face felt as flat as a pancake and his arms felt like they were made of lead. "I wish we'd worn a spaceship suit." Ten minutes later the pressure stopped. Blythe could feel his face again. "Are we up in space now?" He glanced out the window. It's still dark." "You can't see out spaceship windows, Blythe. We have the coated with a special paint. I'll turn on the computer and you can see where we are." Lights flickered and the computer came on. Blythe could see planets whizzing by. "Look, Dad. There's Saturn and Mars. I see Orion too. Wow! This is so cool." They zipped through space, passing huge galaxies that were red and green and purple. They saw nebulas that took up the whole sky and when Blythe looked at the screen he saw Earth. "Dad, there's Earth. Mom and Molly are down there. Do you think they can see us flying in space?" "No, Blythe. There are too many clouds." For two hours the spaceship bounced up and down, swerving to miss asteroids and collisions with small stars. "Are you ready to go home yet? Mom said she was making your favorite supper tonight, macaroni and cheese with hot dogs." "Yum. I am a little hungry. All right. Let's go home." "Tighten that strap. We have to go through re-entry and it can get pretty bumpy and hot as we enter Earth's atmosphere again." Blythe felt the spaceship shake. Beads of sweat gathered on his forehead. The computer showed the planet approaching. "That was fast, Dad. There's Earth already." "It doesn't take long these days. This spaceship is really fast. We're ready to land. Hold on." When Blythe looked at the computer screen, he saw them touch down on the runway and coast to the building again. The spaceship stopped and the door opened. "We're back. Did you have fun, Blythe?" The boy threw his arms around his father. "That was the best fun I've ever had. I got to go to outer space." "Why don't you go and wash up and get a drink while I tell my men to clean up the spaceship." While Blythe ran off, his father spoke to some of the men. "Thanks for taking Blythe and me on the ride in the simulator. He believed he was in outer space. It was a trip of a lifetime." He winked and then went to find Blythe. That night Blythe looked at Orion. "I was there. I was really there." He let out a loud sigh and looked at the heavens.